Few people fail to be impressed by the sound of a large organ being played by a top rate organist. For most of us, our first experience hearing an organ was in a church setting, often with a pipe organ being played. The sound of a well-played pipe organ seldom fails to produce a lasting memory. In the centuries-past golden era of pipe organ building, the organ builders designed stops, or voices, with the purpose of imitating other instruments (such as the flute, the oboe, and some instruments that are no longer common such as a regal, a sackbut, a viol de gamba, etc.). In today’s world, churches and individuals considering acquisition of an organ are faced with a wider array of choices than in the past. Purchase and installation of a well-built new pipe organ can be costly—–some $15 – $20,000 per rank on a new instrument—-and even an average-sized organ of 35 to 40 ranks can push total cost into the $750,000 range and higher. Another equally viable option is the purchase of a digital organ. Digital organs, like pipe organs, reproduce or imitate sounds by retrieving digitally stored data and emitting sound through a set of specially designed high-end speakers. With the great advances in data storage technology in recent years, the amount and authenticity of sound data storage is, simply put, phenomenal. 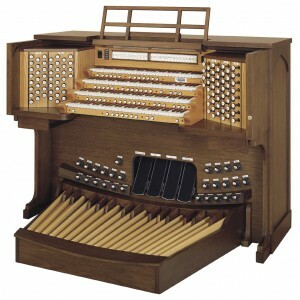 While in the early days of digital sound reproduction, the technique was limited to “sampling” one pipe of a pipe organ and then altering that data mathematically for each pitch of that sound, or rank. Today, vastly expanded digital storage capability has allowed digital organ builders such as Allen to sample each pipe of each rank Beyond that, the sound of each pipe is sampled at the attack, sustain, and cut off point. The bottom line of all of these technical advances is that a digital organ today can convincingly and authentically reproduce the sound of a fine pipe organ. 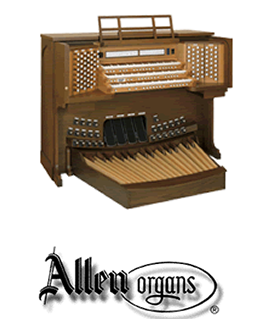 For over 40 years, Allen Organ Company has been at the forefront of progress and development in this area of digital reproduction of authentic pipe organ sound………..at a fraction of the price of a traditional pipe organ. In recent years, Allen has also built “combination organs” with several ranks of organ pipes supplemented by several digital ranks. This can be an attractive alternative for churches or individuals who have an aging pipe organ but face a limited budget or limited space for restoration or expansion of the organ. Allen Organ Company remains the largest manufacturer of church organs in America and has long been the leader of developments in the digital organ arena.